I'll be heading up to Virginia and Massanutten this weekend for my 3rd Catherine's. 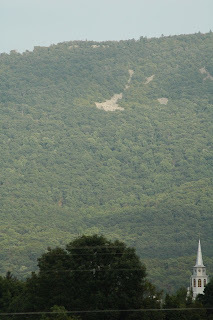 The photo, I think was taken by Anstr Davidson last year and is a view looking up toward Bird Knob. This is a no frills fun run put on by Jeff Reed of the VHTRC but each year I've run there have been some great aid stations and the picnic at the the finish is worth the drive. My first time in 2005 was part of a back to back weekend with the Catoctin 50K on Saturday and CFA on Sunday. If you haven't read that story , you can read it here. I think it got up to about 99F that day and several people had problems with the heat and needed assistance. I was going too slow to notice. Last year it only got up into the low 90's. According to the race website, a couple of years it only reached about 71F. Where was I those years? We might get lucky and only have low 80's this year. The course used to be just over 26 miles but some changes were made getting it closer to an actual 50K. It is a slow, hard hilly course in any case. Last year I had my first bear encounter on the trail but I think I was more worried about the ants. If you were to fall on the ant road, all that the rescuers would find are your bare bleached bones. I'm looking forward to some fun with my VHTRC friends and getting some photos along the way. Here is a link to some info on Catherine's Furnace, the runs namesake. It was named after Catherine Forrer whose family owned the furnace from 1837 to 1867. Here is a nice photo. If you like more info on furnaces in the area, here is a link with lots of info.